You know how I always say I do not like love stories? Yeah, this is another romance novel. Or at least an anthology of romance stories. And I actually liked it, I am sick? 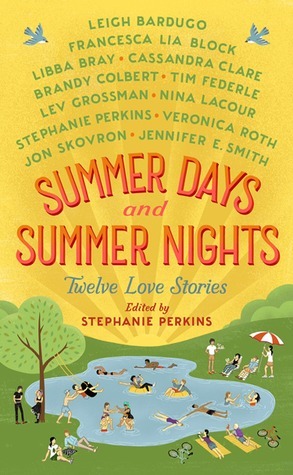 I give the anthology Summer Days and Summer Nights edited by Stephanie Perkins four out of five hearts. It was a great read and almost all the stories were really interesting. Stephanie has put a great mix of stories together and they truly deserve to be called summer reads. Head, Scales, Tongue, Tail by Leigh Bardugo throws the reader straight into this book full of summery stories. Truly a Leigh Bardugo story and I loved it. It was something as beautiful as her stories in The Language of Thorns. The End of Love by Nina Lacour was interesting, at first I didn’t understand how this story could be called a love story. But the further I got into it I started to see. Here the romance was more subtle, it made me enjoy the story more than I think I would have if the romance was thick. One of the less interesting ones was Last Stand at the Cinegore by Libba Bray because it was more zombies than romance. It has a little romance in it but not very subtle and was overshadowed by the zombies. Sick Pleasures by Francesca Lia Block was interesting and confusing. The characters don’t have names but are just called U and A. The story was oddly written with mostly just brief discriptions. Stephanie Perkin’s own story In Ninty Minutes, Turn North is a continuation of a story she had in My True Love Gave to Me, which I haven’t read. I didn’t enjoy it all too much because of this. But it was still very interesting. Souvenirs by Tim Federle was very clinical. It’s about the day Matt and Keith break up because their ways are parting at the end of summer. Matt has a great character arc and tries everything to pull on the emotions of the reader, it’s good. Inertia by Veronica Roth is one of the few science-fiction stories in the anthology and is very reminiscence of Tris and Four. I wish it had been more different from her original love story. Love in the Last Resort by Jon Skovron was a strange story, it was interesting but a lot of characters for such a short story. The ending was great however. Good Luck and Farewell by Brandy Colbert is a dark story, beautifully descriptive. A lot of diverse subjects like race and depression. It’s a great story for this anthology. Brand New Attraction by Cassandra Clare has great descriptions, it set the stage clearly. It was a little bit rushed but just how I like my Cassie Clare stories. A Thousand Ways This Could All Go Wrong by Jennifer E. Smith was adorable and cute. The summer camp really brought me to that place and Jennifer made me care for the characters. The Map of Tiny Perfect Things by Lev Grossman is such a great story. I didn’t know what to expect when it became clear it was sort of a Groundhog Day story. But it was great. It was cute and thought-provoking. It was very different from the others and I liked where it ended. Overall Summer Days and Summer Nights edited by Stephanie Perkins was a great read even if you are not the romance person. This entry was posted in Book Review and tagged Adventure, Anthology, Book Review, Brandy Colbert, Cassandra Clare, Drama, Fantasy, Francesca Lia Block, Horror, Jennifer E. Smith, Jon Skovron, Leigh Bardugo, Lev Grossman, Libba Bray, Mystery, Nina LaCour, Romance, Science-Fiction, Short Stories, Stephanie Perkins, Tim Federle, Veronica Roth. Bookmark the permalink.